This is not a celebration cake, strictly speaking. I didn’t make it for anyone’s birthday, didn’t stick it through with candles or banners or sparkly sparklers (though it would look sort of adorable with the formers and latters, let’s be clear). This is a straight up “I need chocolate cake” situation. The sprinkles are a ruse. Do you get this situation? 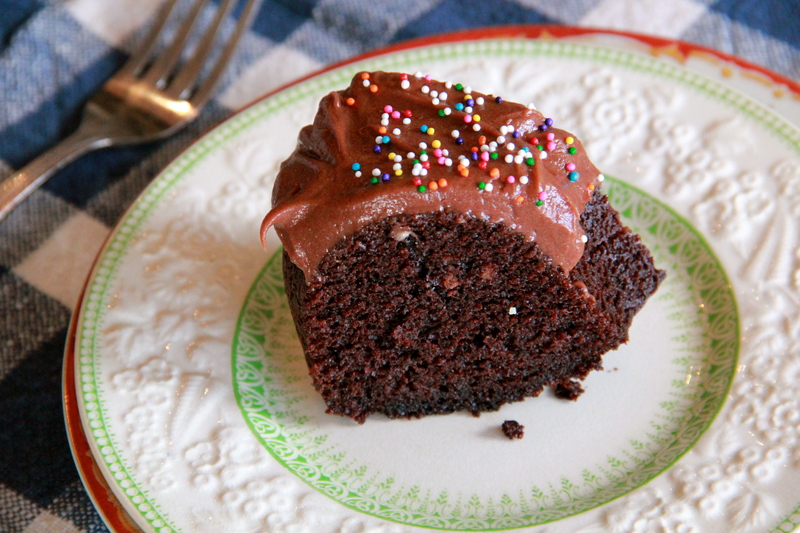 The “I need chocolate cake, preferably now and not later and also definitely with frosting” one? I bet you do. I mean, you’re human (you are, aren’t you?). And let’s look at the facts: the east coast has had a rough Sandy week. I woke up on the wrong side of the bed this morning. The election is tomorrow. It is tense around here, people (by “here” I mean “America” and “in my head”). Let’s cut that tension with a cake knife. We’ll eat a slice, and then another, and we’ll be thankful – for warm blankets, batteries, democracy, and chocolate. With sprinkles on top. This cake has mayonnaise in it. It’s not weird. Mayonnaise is really just eggs, oil, and vinegar, if you think about it. And now that you’re thinking about it, it makes sense, no? The mayo factor, combined with the buttermilk and vegetable oil here, make for a deliciously moist and tender-crumbed cake, with plenty of chocolate flavor, to boot. To boot — who came up with that expression? What does it even mean? Just… let’s just eat cake. Heat oven to 350 degrees F, and grease an 8-inch bundt pan. 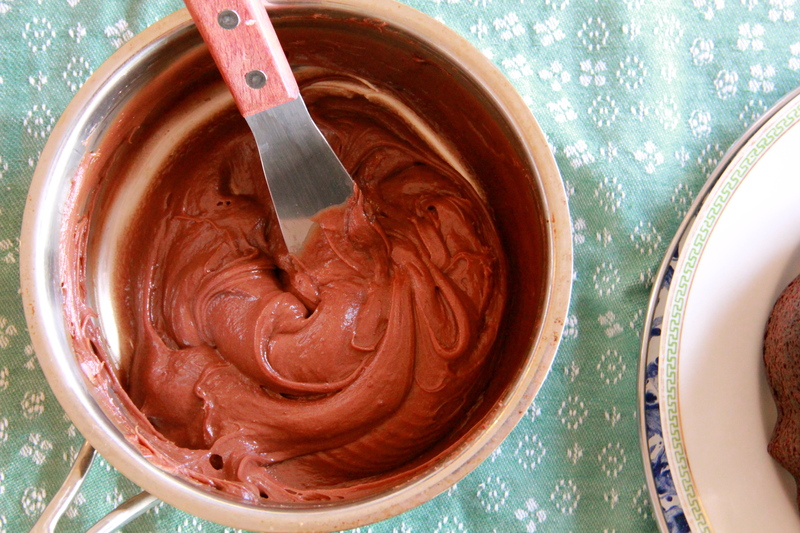 First, make the frosting: melt the butter and chocolate together in a small saucepan over low heat, stirring to make sure the chocolate doesn’t burn. Remove the mixture from the heat, and whisk in the coconut milk. The frosting will be quite loose – it needs to sit for awhile to firm up. While it sits, make the cake. In a small bowl, whisk together the hot water, espresso powder and cocoa powder until dissolved and smooth. Set aside. In another small bowl, whisk together the flour, salt and baking soda. In a larger bowl, whisk together the sugar, egg, yolk, and mayonnaise. Whisk in the buttermilk and oil slowly, until incorporated. Add the flour mixture all at once, and whisk gently to combine. Add the chocolate/espresso mixture to the batter, and stir to fully incorporate. Pour the batter into the prepared bundt pan and bake for 45 minutes to 1 hour, until a skewer inserted into the center comes out clean. 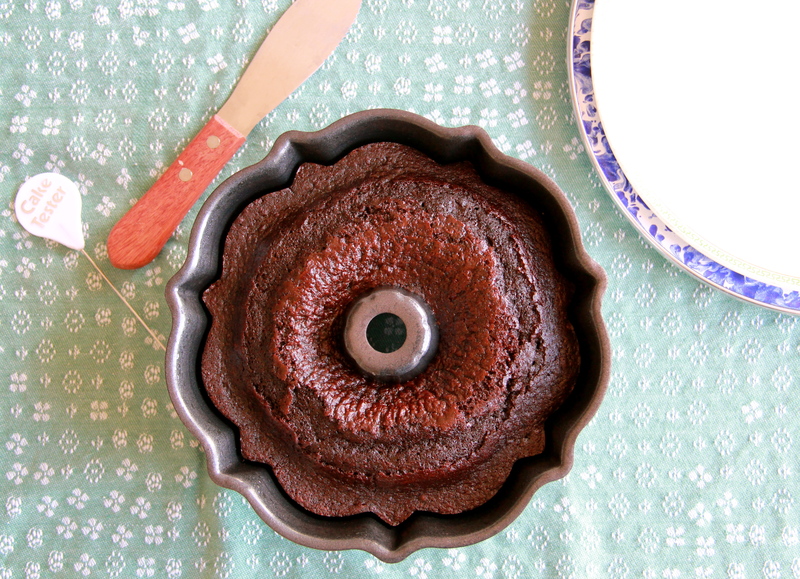 Allow the cake to cool in the pan completely, then invert onto a plate. Check the frosting. If it’s still looking a bit loose, chill it in the refrigerator until it reaches your desired consistency. Thickly frost the cooled cake, and decorate with colorful sprinkles, if you like. The cake will keep, well wrapped in the refrigerator, for about 4 days. making it; now that i have my power back! love and miss you, chef molly! hugs to ben. Can you please check the recipe? Your photo looked so delicious, I quickly whipped up a batch of batter, but it failed miserably. There is not enough sugar in it, and WAY too little flour. The cake looks great, I just think that something must have happened when you entered the recipe. Thanks. Hi Lee – sorry this didn’t turn out for you! The batter is supposed to be very loose – did you try baking it? I went back and checked my handwritten notes – they read the same as what’s written here. There’s definitely a chance I just wrote something wrong, so will plan to go back and re-test this recipe. Thanks for letting me know! 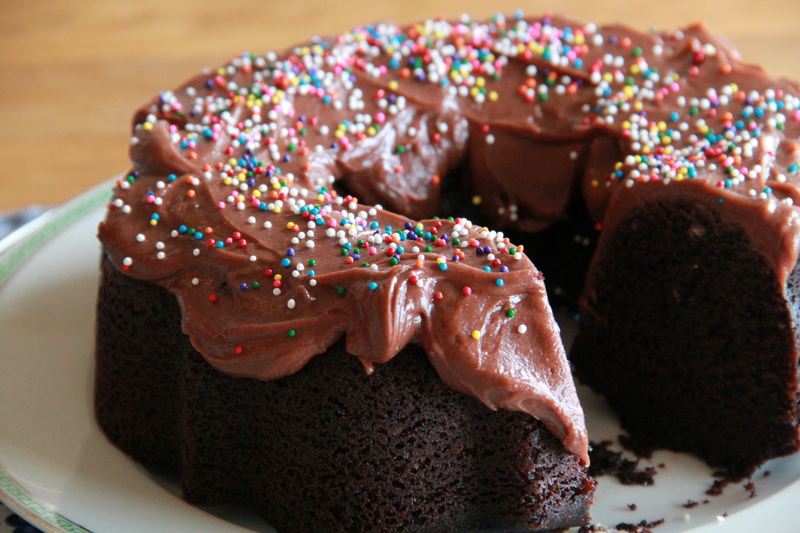 Hi, I would like to make this bundt cake. I see from the comment above you were going to check your notes about the flour and sugar. Is this recipe correct?? ?